This time, with more flour-covered hands on deck! My assistant works for a big company, so it's no surprise that there are a number of avid bakers who share her passion for crafting all things sweet and fresh-out-of-the-even. She and her coworker, Christine, recently started a baking interest group for employees to share recipes and participate in fun events, from cupcake crawls to bakeoffs. They kickstarted this club with a bake sale fundraiser themed "Holiday Sweets and Winter Treats," with all proceeds benefiting the Community Services Agency of Mountain View -- a food bank just down the street from the office. Take twenty brilliant bakers, mix in pounds and pounds of butter and sugar, whip up a good cause, and you've got yourself a recipe for a sweet success. 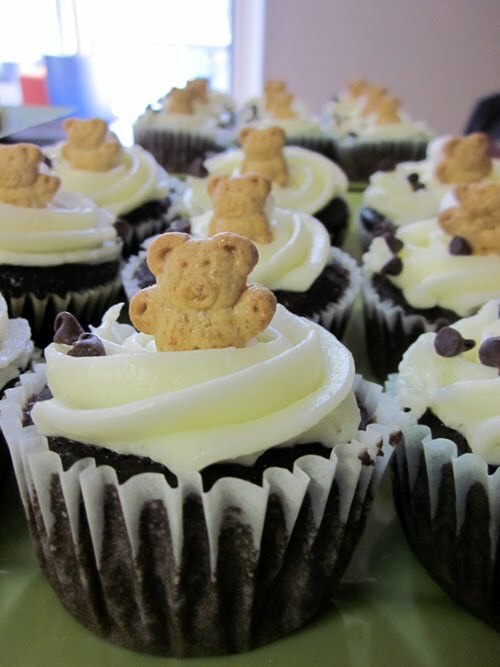 Here are some of the S'more cupcakes that my assistant sold at the event: chocolate cupcakes with a gooey marshmallow center, topped with vanilla cream cheese frosting and a cute little Teddy Graham. The only thing missing was a campfire to keep our bakers warm on this chilly Tuesday afternoon. 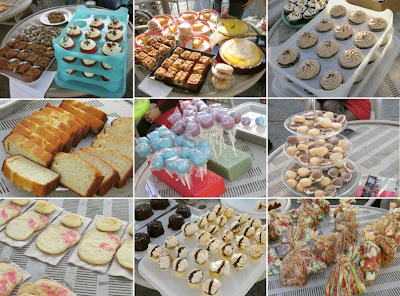 In only an hour and a half, the bakers collectively raised $850 in sweets. 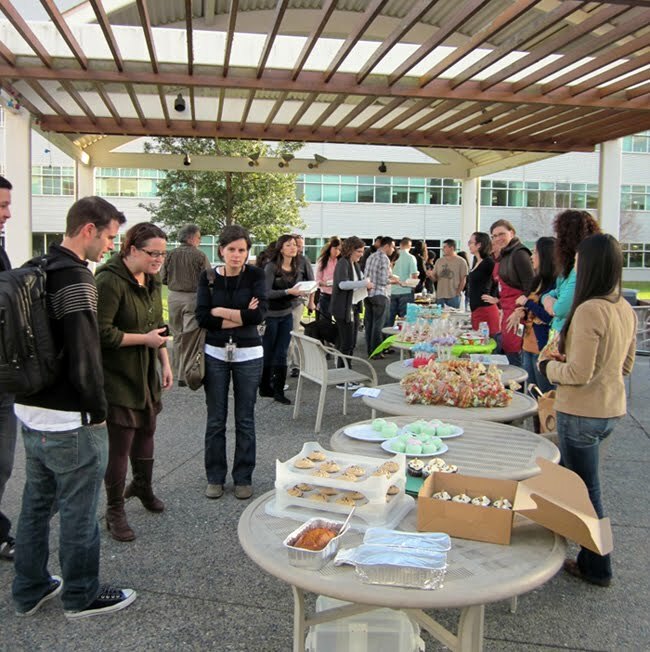 There were macarons, cheesecakes, cupcakes, cookies, cake pops, and plenty more to boost blood sugar levels and good spirits. With the company match, the group donated $1700 to CSA. Thank you, everyone who participated! 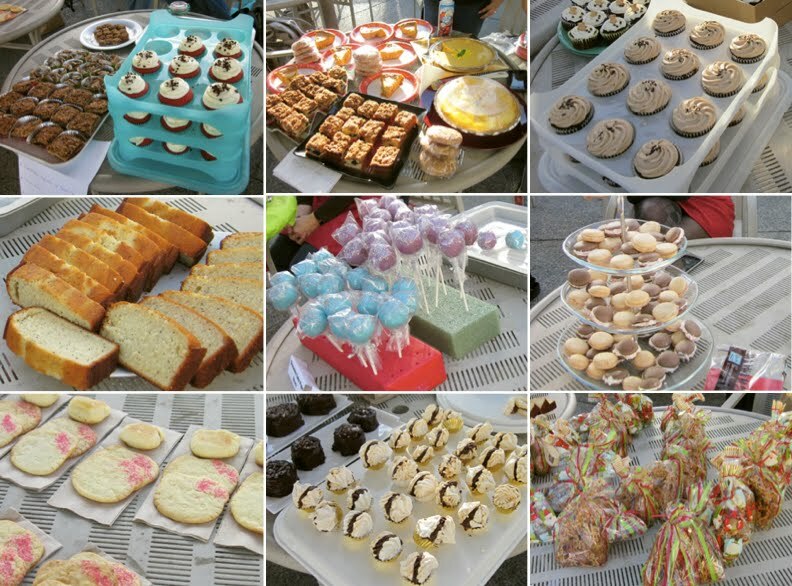 Whether you drew your spatula and contributed your baked goods or dropped some Washingtons to indulge your sweet tooth, this event couldn't have happened without you. Have you been good this year? I know I have. So there will be no lump of coal in my stocking. (Santa, if you're reading, I want this in Aqua Sky -- thanks!) What, reader, don't you believe in Santa? Don't forget: I'm imaginary too -- which means I know the old guy personally. He, his Mrs., and I used to have afternoon tea with the Tooth Fairy and Bigfoot before Little Miss Molar became too much of a diva and Biggie started P90X. She made three different kinds of cupcakes. 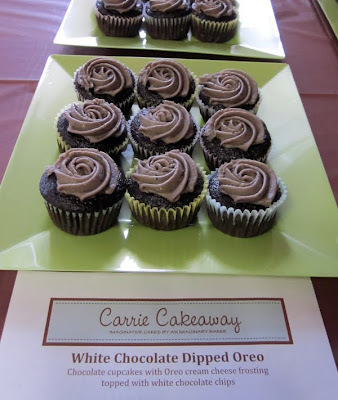 First, Oreo cupcakes -- rich chocolate cake with Oreo cream cheese frosting and a sprinkling of white chocolate chips upon request. 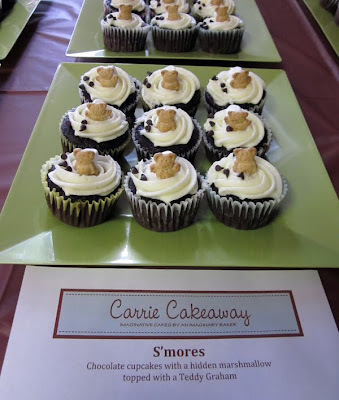 Next, our current bestseller and personal favorite: our S'mores cupcakes. Rich chocolate cupcakes with a gooey marshmallow center, topped with vanilla cream cheese frosting, a cute little Teddy Graham resting against a mini marshmallow pillow, and a couple of mini chocolate chips. Almost too cute to eat. Almost. And my personal favorite: our classic Mudslide. 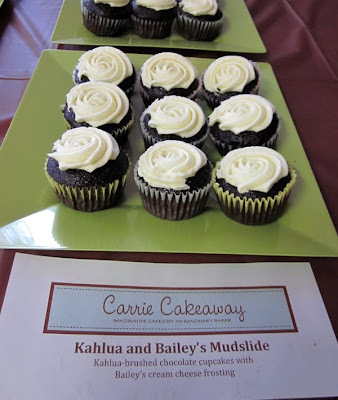 Kahlua-spiked chocolate cupcakes brushed with Kahlua and topped with creamy Bailey's frosting. This is as close to "drinking on the job" as you can get while still remaining on Santa's nice list. 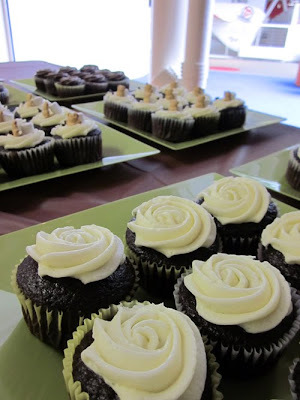 And as for the results of this little bake sale? She sold all of her 90 cupcakes for $280. That, doubled by the employer gift-matching program, means $560 for the SF Food Bank, which translates into $3,360 worth of food distributed in San Francisco and Marin counties. Many, many thanks to friends and coworkers who came to support this great cause. Helping out never tasted so sweet, and it wouldn't have been possible without you!